The nervous system is one of two organ systems that maintain internal order within the body. It coordinates the activities of muscles and organs, receives input from sense organs, triggers reactions, generates learning and understanding, and provides protection from danger. This is primarily conducted through electrochemical signaling that directly influences effector cells, either causing a muscle to contract or inducing a gland to release its contents. Occasionally, it modulates the body’s response indirectly by affecting endocrine glands. The nervous system in humans is made of the brain, spinal cord, sensory organs and all the neurons that serve as communication channels between the various organs of the body. It is primarily made of a single type of cell called the neuron. Colloquially, they are also called nerve cells. Neurons are made of a central cell body and a number of extensions. The cell body is also known as the soma, and extensions can be either dendrites or axons. Usually, smaller extensions close to the soma are known as dendrites, and as a general rule, they are adapted to receive stimuli. 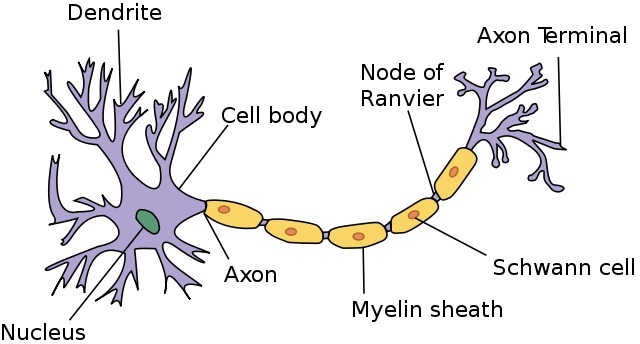 Many neurons have one (and occasionally more than one) long axon that can be over a meter long. Axons can contain a lipid covering called the myelin sheath that helps the neuron transmit electrochemical messages quickly towards another neuron or an effector cell. Bundles of neuronal axons are called nerves or tracts, depending on their location. Specialized cells called glial cells, whose role includes the production of myelin and the supply of oxygen, usually support neurons. Glial cells are also important in providing mechanical support and protection from pathogens. Neurons can form connections with each other to create circuits and networks that influence learning, perception, behavior, and even create predictable physiological responses to external stimuli. The primary function of the nervous system is to receive information and to generate a response to that stimulus. The information and the response could be simple, subtle or complex. For instance, when a hot object is touched, its temperature is conveyed quickly to the central nervous system and the response is an immediate reflex of removing the hand, through the action of skeletal muscles. A few such incidents could also lead to the formation of learning and long-term memory, encoded as a series of neural connections. Alternatively, it could be the sensation of a cold drink on a hot day, where the body responds with a feeling of pleasure. This is expressed through neuronal activity in various parts of the body, depending on the individual, not relying on any obvious effector cell. On the other end of the spectrum, the stimulus could be indirect, such as the sound of rustling leaves in a quiet forest, indicative of an animal slithering. This could lead to a cascade of responses. The body might respond to this sound with an adrenalin rush, prompting a flight response, and change the metabolic state of skeletal, smooth and cardiac muscles. It could also retrieve memory and try to recollect the possibility of the animal being a venomous snake, and the best possible route for escape. Much of this happens nearly instantaneously. Some parts of the nervous system can encode information from stimuli so intricately and deeply, that victims of traumatic events relive painful moments in their entirety, with the whole host of physiological responses, even with an unrelated stimulus. Among the primary modes of input into the nervous system are the electrical impulses that arise from sense organs. Touch, sound, sight, smell, and taste are conveyed to the nervous system, in order to integrate information and assess the nature of the external world. Similarly, a number of neurons act as sensors for the internal state of the body. For instance, sensory neurons in the eyes, nose, and tongue can inform a person about the presence of delicious food, and create a desire to eat. After the food has been ingested, neurons in the digestive system can sense the stretching of stomach muscles. When this information is conveyed to the central nervous system, it triggers a satiety response – the feeling of ‘fullness’ and a willingness to stop eating. These are complex responses that do not directly involve only a muscle cell. There is a higher order integration occurring at this point, where memory, learning, cognition, and emotional state influence the physiological response mediated by the nervous system. Thus, while the nervous system can be considered as the center for receiving, processing and transmitting information, its functions are complex in most organisms. In humans, it is important for thought, reasoning, language, perception, and speech. Parts of the central nervous system control voluntary and involuntary muscle movement, and even peristalsis and digestive movement. It is important for the maintenance of balance, internal temperature regulation, and circadian rhythms. The rate of breathing, blood pressure, and heart rate are also modulated by the nervous system. It integrates its actions with the endocrine system in order to provide the body with a coordinated, and fine-tuned response to a stimulus. 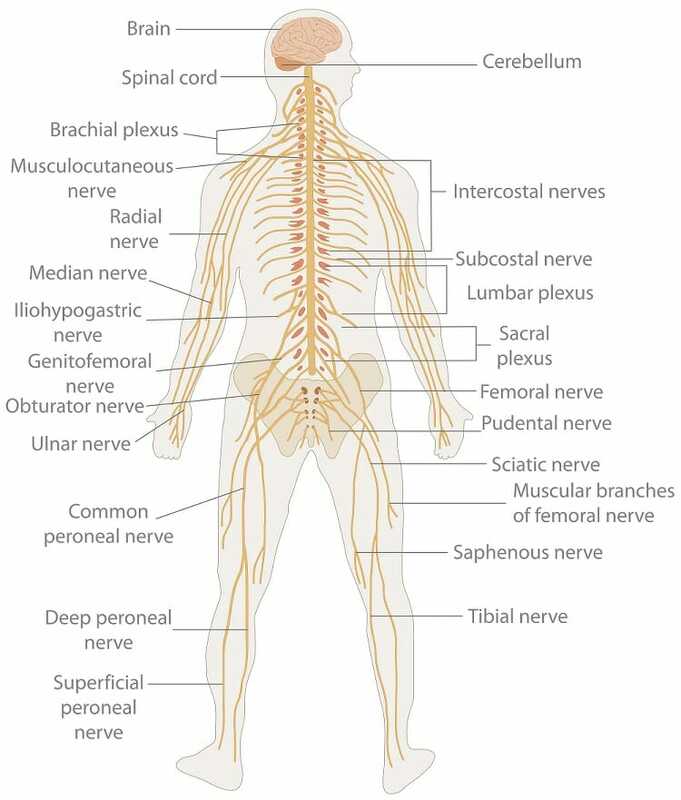 The nervous system in humans is made of the brain and spinal cord, along with the primary sense organs and all the nerves associated with these organs. The brain and the spinal cord form the central nervous system (CNS). All other neuronal tissue is brought under the umbrella of the peripheral nervous system (PNS). Therefore, the PNS includes neurons within sense organs, other sensory nerves, and all motor nerves that deliver messages to different parts of the body. Functionally, the organs of the nervous system can be further divided into different parts. For instance, the brain is situated within the cranial cavity and weighs less than 1.5 kgs. However, it is the seat for many higher-order mental functions, such as planning, consciousness, perception, and language. It is broadly divided into the cerebrum, cerebellum, and medulla. The cerebrum is the largest part and is the section that is seen most obviously in external pictorial representations of the organ. It contains two hemispheres of nearly equal size and each hemisphere has four lobes. These lobes, called the parietal, temporal, frontal and occipital, have distinct functions, being involved in impulse control, problem-solving, visual perception, hearing, language, and speech. Though the hemispheres of the brain have some extent of plasticity, specific tasks remain localized to specific sections of the cerebral cortex. Neurons form the basic functional unit of the nervous system. They can be afferent or efferent neurons based on whether they carry information towards the CNS or transmit signals from the CNS. Some, called interneurons, are important to integrate information from different stimuli and to create a unified response. The nervous system is an enormously complex system for coordinating an animal’s behavior and helping it navigate and react to the outside environment. In the least complex organisms, the nervous system can consist of only a few neurons and no central brain. At the other end of the spectrum, the human brain is capable of complex thought, symbology, and language. Generally, the nervous system is structured so that inputs from the environment (vision, touch) are sent to the brain. Here, they are quickly processed and connected to nerves. Then, the brain sends signals to various other parts of the body. These can be somatic signals, which enact voluntary movements. Alternatively, they can be autonomic signals, which act on glands, smooth muscle, and other parts which are generally part of the subconscious. Together, coordinated response to almost any situation can be completed. Organisms without a brain typically coordinate actions in a similar manner, though their nerves are more evenly distributed throughout their bodies. The nervous system can be attacked by infectious pathogens – bacteria, viruses, fungi or protozoans. Bacterial infections such as tuberculosis or syphilis can colonize nervous tissue as a secondary site of infection in advanced stages of the disease. The meninges covering the central nervous system are particularly susceptible to infection, especially when head trauma allows pathogens from other organs access to these delicate tissues, through the cerebrospinal fluid. Other disorders in the nervous system include blocks in the vascular networks of the brain due to strokes. Strokes can lead to large-scale loss of function, up to and including complete paralysis. Ailments associated with the accumulation of improperly folded proteins are debilitating since neurons must be actively used to build more neurons and create circuits within the brain. Many of these ailments are progressive, i.e., the symptoms become more debilitating with age, and include Alzheimer’s disease and Parkinson’s disease. For some ailments, there is a clear genetic factor involved such as in Huntington’s disease and in some forms of ataxia. In many such cases, there is a single protein whose gene is mutated in such a way that large-scale changes to the DNA sequence accumulate over successive generations. In most other neurodegenerative diseases, both genetic and environmental factors seem to be involved. The cause of Alzheimer’s disease is still not known. Autopsies of patients who have suffered from the ailment often reveal protein plaques in the brain. The earliest hypothesis about the cause of this disease involves a deficiency in a neurotransmitter and the degeneration of the neurons that depend upon this molecule. Other theories involve specific proteins (amyloid precursor protein, tau protein) that form aggregates in the extracellular space in the brain. There is also evidence suggesting that eating animal proteins can lead to autoimmunity, which subsequently deposits proteins plaques within the brain. Most patients have an enlargement of the brain ventricles, and a shrinking of active nervous tissue in the cortex and hippocampus. Therefore, they show a progressive decline in cognitive function, learning, memory, and mood regulation. Short-term memory loss and the inability to acquire new learning are among the earliest symptoms. Thus, they might repeat themselves frequently, since they cannot remember the contents of the earlier parts of a conversation. As the ailment progresses, they might only retain their earliest memories. They may no longer recognize their caregivers or remember where they live. There is a simultaneous loss of language as well, and some patients develop paranoia. Unlike Alzheimer’s disease, Parkinson’s does not severely affect cognition. However, there is a progressive loss of motor ability, beginning from fine motor skills, and changes to posture and balance. This is usually followed by the appearance of mild tremors, especially in the fingers, or toes. Slowly, there is difficulty in performing repetitive tasks with the hands or legs, such as writing or walking. Deliberate movements become difficult, especially ones that require coordination between the limbs and eyes. The primary region of the brain affected by the disease is the substantia nigra, a region in the midbrain. As in Alzheimer’s, the definitive cause of Parkinson’s disease is not known. While genetics does play a role, environmental pollutants, injuries, and diet can influence the onset of the disease. As the disease progresses, the patient needs help for accomplishing every task, including the maintenance of personal hygiene. Since cognitive function is unimpaired, he is aware of his dependency. Therefore, managing the emotional impact of Parkinson’s is as important as attending to the loss of motor ability. 1. Which of these refers to structures within a neuron? 2. Why do diseases involving abnormally folded proteins preferentially attack the nervous system? 3. Which of these diseases has a clear genetic cause? 4. What is the main function of the nervous system? B. To send signals from sensory nerves to the brain. C. To send signals from the brain to various parts of the body. 5. Phantom pain is a phenomenon in which someone loses a limb to an accident or amputation, but can still feel pain in the limb after it is gone. To treat this condition, doctors sometimes stimulate nerves in other parts of the body, such as nerves in the face when someone suffers phantom pain in their arm. Why does this stop the pain from the phantom limb? A. The brain maps for these different parts of the body are located next to each other in the brain. B. This is a nonsensical treatment. C. This is basically acupuncture, which is total pseudoscience. Lodish, H., Berk, A., Kaiser, C. A., Krieger, M., Scott, M. P., Bretscher, A., . . . Matsudaira, P. (2008). Molecular Cell Biology 6th. ed. New York: W.H. Freeman and Company. Reece, J. B., Urry, L. A., Cain, M. L., Wasserman, S. A., Minorsky, P. V., & Jackson, R. B. (2014). Campbell Biology, Tenth Edition (Vol. 1). Boston: Pearson Learning Solutions.